In a region admired for its advances in technology and engineering, Wright State University stands tall in its pursuit of innovation. From the seven Ohio Centers of Excellence to the Wright State Research Institute, the university's community of researchers and thought leaders are solving problems and turning the unknown into the known. 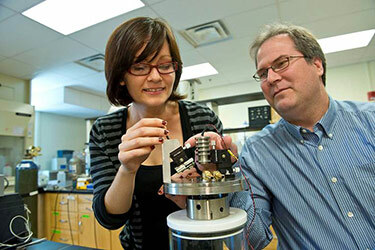 Explore the many research centers and university research sectors on campus. See why so many organizations, military units, and universities are seeking to partner with Wright State University. Graduate students can work with faculty experts, fellow graduate students, and possibly undergraduate students on the faculty member's research. You can also discuss your ideas for independent research. Graduate students may apply for Graduate Research Assistantship positions that may be eligible for tuition remission and annual stipends. Wright State computer science and engineering researchers are helping to develop a pilotless drone that could ferry medical supplies or emergency responders to disaster zones. Virtual reality equipment that will help teach everything from anatomy to science and engineering will be available to Wright State students thanks to a workforce development award from the state. Christiana Draper, an M.D./Ph.D. student at the Boonshoft School of Medicine, won a National Institutes of Health Diversity Supplement Award to support for her ALS research. Reshaping the network of hospital trauma centers to increase their effectiveness in saving lives and better utilize resources is the goal of research led by Wright State. Ryan Griggs and his fellow researchers have found that changes in neurons in the brain may be responsible for cognitive dysfunction associated with Type 2 diabetes. Students and faculty in the Department of Biological Sciences turned land off University Drive between the Nutter Center parking and Mini University into a prairie. For more research news and many other stories be sure to visit the Wright State Newsroom.